Happy Canada Day weekend and hello! 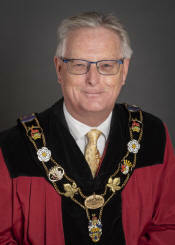 I'm Mayor John Henderson and it's my pleasure to welcome you to Cobourg. The Waterfront Festival, our signature three-day event, attracts more than 10,000 visitors each year. The main event is our Canada Day celebration which is kicked off with a downtown parade and ends with a dazzling fireworks show over our harbour. Whether you are here for a short or long visit, we hope you can take in the Rotary HarbourArts Show, the Lions Marketplace, eat some delicious food and ride the mid-way. I would like to thank our major sponsors who partner to organize this first-class event, the Rotary Club of Cobourg, the Lions Club of Cobourg and the Town of Cobourg. Cobourg is a town that is rich in heritage and culture. Our downtown streetscape lined with unique shops and Victoria Hall at its centre will take you back in time. If art is your passion, visit the Art Gallery of Northumberland, or if you’re a history buff, take a stroll to the Sifton-Cook Heritage Centre. Want a bigger picture of all that Cobourg has to offer? Visit experiencecobourg.ca where you’ll find information on our many other major Town events, such as our award winning Sandcastle Festival on our white sandy beach and the Rotary Club Ribfest in August. Our events are as diverse as our people. From Northumberland’s rolling hills to our meandering lakeshore on the Waterfront Trail and everything in between, I take pride in saying that Cobourg has it all. With so much to see and do, you may find that just one trip to Cobourg isn’t enough? Enjoy this weekend and we hope to see you again!